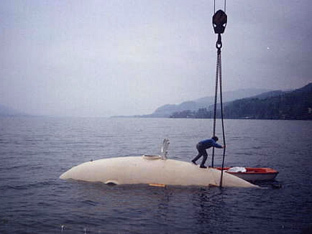 concrete sub was built and dived by Wilfried Ellmer in 1996. The subs hull is formed from 18" thick concrete and features a front view port, and two side ports. 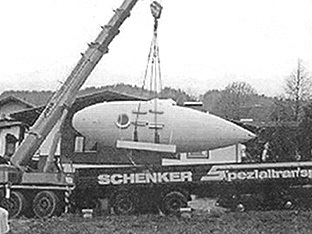 Initially the concrete sub had no tower, but one was added later to prevent water from swamping the hatch. Although concrete may be an unorthodox choice of materials for a submersible, many underwater structures including some pipelines, are formed from concrete. Concrete can be formed relativley easily to any shape and is expected to have a stuctually sound lifespan of around 120 years.